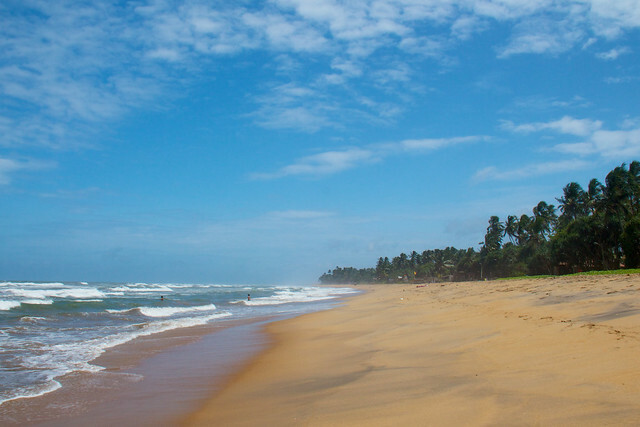 Kalutara Beach is distinguished for its sloping landscape and harsh undercurrents. Situated on the Western coast of Sri Lanka, the beach is less commercialized due to the inability for people to swim in the ocean. The strong waves make it highly dangerous for people to swim, and one can go till maximum waist high level water, that too, with extreme caution. The beach itself does not have any sun chairs, shacks or eateries, making it a little inconvenient of visitors to spend long hours at that one single place. However, it is lined with fancy international standard resorts that occupy private parts of the beach, providing better facilities for enjoying sunbathing and relaxing. During some parts of the day, a few hawkers and tour sellers roam the beach to persuade buyers, however, on polite request, they do quietly walk away. Kalutara beach is apt for silent morning and evening walks, as the sunset skies are painted with hues of orange and gold, making it a stunning sight. Sea shell picking is another fun activity to undertake at this beach. So put on those flip flops, smother sunscreen and spend a lovely few hours at Kalutara! The beach is lined with many roadside stalls that sell rugs, basket wares and mats. There are plenty of coconut tress leaning lazily towards the shores and the seas.